they’d been swept from, kept from. who’ve fallen, their faces now faded. of home in every stroke. 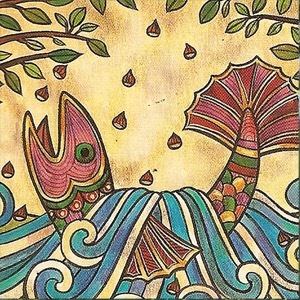 Picture from the internet of the Salmon of Knowledge. Damien, this is wonderful. A thing of beauty. I love it! There will indeed be a fine ceili before the month is out! Wow! Lovely Damien. Beautiful poem. Thanks Merril! This is now my lunch break Challenge! Never the dull moment! An amazing poem to just toss off at lunch time!